There has been considerable expansion in the use of digital soil mapping technologies and development of methodologies that improve digital soil mapping at all scales and levels of resolution. These developments have occurred in all parts of the world in the past few years and also in countries where it was previously absent. There is almost always a shortage of data in soil research and its applications and this may lead to unsupported statements, poor statistics, misrepresentations and ultimately bad resource management. In digital soil mapping, maximum use is made of sparse data and this book contains useful examples of how this can be done. This book focuses on digital soil mapping methodologies and applications for areas where data are limited, and has the following sections (i) introductory papers, (ii) dealing with limited spatial data infrastructures, (iii) methodology development, and (iv) examples of digital soil mapping in various parts of the globe (including USA, Brazil, UK, France, Czech Republic, Honduras, Kenya, Australia). Below a brief summary of the Southern Africa Project, more are in the pipeline. Arenosols cover about 13% in Sub-Saharan Africa and are widely spread in the Southern part of the continent where crop yields are low and poverty and malnutrition are endemic. Knowledge about the spatial distribution, properties and land cover of Arenosols can be used to design programs to alleviate the major constraints upon agricultural production. This paper reviews the importance of Arenosols in eight countries of Southern Africa (Angola, Botswana, Lesotho, Mozambique, Namibia, South Africa, Swaziland and Zimbabwe). Estimates of their extent are based on SOTER databases. 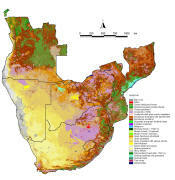 The total extent of Arenosols in the eight countries is 169 million ha: extensively in Angola and Botswana (>50% of total land area) but also in Zimbabwe, South Africa and Mozambique (>15% of total land area). About 26.3 million ha of Arenosols are under forest; 104.7 million ha under savannah and 3.5 million ha is desert and dunes. In total, 6.5 million ha of Arenosols are under agriculture cropland, most of which is located in Angola, Botswana and South Africa. Arenosol topsoils in Namibia and South Africa are mostly alkaline but in Angola and Zimbabwe, the average topsoil pH of Arenosols is below 6. Organic carbon is uniformly low in Arenosols of Southern Africa and rarely exceeds 10 g kg–1. Higher C contents are found in soils with slightly higher clay content, whereas higher C contents are also associated with higher cation exchange capacities (CECs). The low CEC and low water holding capacity necessitates addition of organic manures, but quantities available are very limited. Although water is limiting in many areas, inorganic fertilizers are indispensable to increase agricultural production on Arenosols in Southern Africa.